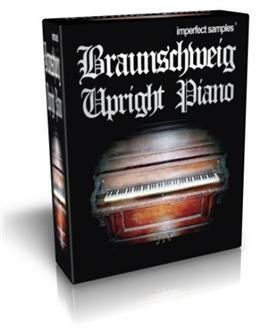 The life-like Braunschweig Upright (Pro) is the largest single upright piano library in the world. The Braunschweig Upright (Pro) contains 14 velocity layers of one microphone perspective, and 11 layers of another. Totalling over 15GB of data, this upright piano library not only sounds real, it has a versatility not before seen in upright piano sample libraries. Microphone perspective 1 has been recorded 2 inches from the soundboard, for an extremely dynamic, larger-than-life sound. Perspective 2 has been recorded closer to the hammers, for a percussive, soft sound.